20121012 - Up and at the desk. The boys home from school and SO LOUD!!! L got home and started getting ready for G's party tomorrow. I took a break and D&I hit the post office, insurance office, garage sale and finally the new scout store to pick up badges for the troop. Home to get LJ&G and to the new Firehouse subs for dinner. 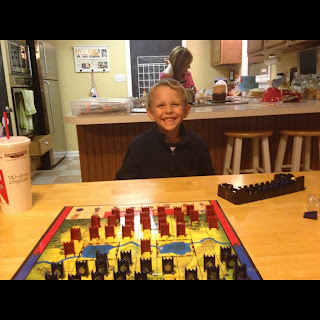 Home and D&G in the back playing football, L working of D cake and J&I playing Stratego. Everyone in and now playing G.